Every once in awhile a book is written that speaks right to your soul. 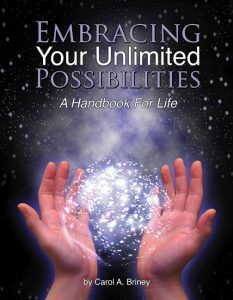 Embracing Your Unlimited Possibilities is one of those books. This handbook is full of down to earth wisdom and useful insights that invite you to open your heart and mind to your authentic self. Carol A. Briney’s conversational style of writing makes you feel as if she is sitting in your living room sharing a cup of tea and speaking directly to you. The step-by-step exercises offer a road map that will not only help you to realize your limitless potential for joy and happiness; it will also help you to embrace it, thus allowing you to create and live the life of your dreams. Simply click one of the above links to order!